As has been the case for several years, the SMPTE conference was held above the Dolby Theater in Hollywood California. There was a record turnout this year and because of the growth of the conference and exhibition, it will move to downtown LA next year. There are always a number of very good and very deep technical papers presented at the conference that I often need to study in some depth before writing about what they were about and why they were important (full coverage will be available soon as part of the subscription service). However, let me quickly summarize some of the highlights that I have gleaned so far. In a paper from SpectraCal/Portrait Displays, Tyler Pruitt called on display and device makers (and TV makers in particular), to create a new by-pass mode to aid in the evaluation and calibration of HDR displays. He said that one of the things that HDR displays do is color and tone (luminance) remapping. This is needed when the color and luminance capabilities of the display are less than the mastered HDR content. These changes are done at the beginning of the processing pipeline. How this is done by each display maker is often proprietary and creates the “look” they want to achieve. However, the calibration controls are at the end of the pipeline. Making adjustments here will impact the way the proprietary color and tone mapping algorithms modify content. What’s worse, these algorithms are based upon an assumption of the native gray scale (panels still use a gamma EOTF) and color performance of the panel. But there is always some variation in the manufacture of panels and so some tolerance to these parameters. “Wouldn’t it be great if we could by-pass all the processing to access and calibrate the native performance of the panel?,” mused Pruitt. “This would also preserve the performance of the luminance and color remapping and make it more accurate as it is based on actual, not assumed panel performance.” He said that Portrait Displays has already worked with LG and Dolby to implement this for the Dolby Vision mode in LG TVs and that he would like to see other panel and TV makers adopt this approach as well, as all should benefit. We agree. One of the topics that has been discussed quite a bit at previous SMPTE meetings is the artistic value of moving to higher and even variable frame rates for cinematic presentation. While DLP cinema projectors can run at higher frame rates, they cannot do variable frame rates, where the rate would change from one frame to the next one. Tim Ryan for Texas Instruments described what it will take to allow DLP cinema projectors to be able to offer variable frame rates in the newest series 3 projectors. He described the mechanics of making the frame rate change but the key is to add metadata to the content, through a change to ST-291-1, to add information on when a frame rate change is coming and what rate it will change to. This presentation starts the discussion so, hopefully, changes will be ratified soon to allow filmmakers to consider this option in the future. Martin Richards from Dolby presented a nice model to understand the real contrast in a cinema theater – and Dolby Cinemas in particular. Their model is very similar to those developed by RealD and Barco and was backed up with measurements in real theaters. Not surprisingly, Dolby Cinema had higher contrast when the other light contributions were low, but were only slightly better than a conventional DCI projector as the light contamination reached higher levels. Contributors to reducing contrast were exit and step lights, reflections of light from walls, people and seats, and veiling glare in the projector optics and port glass window. 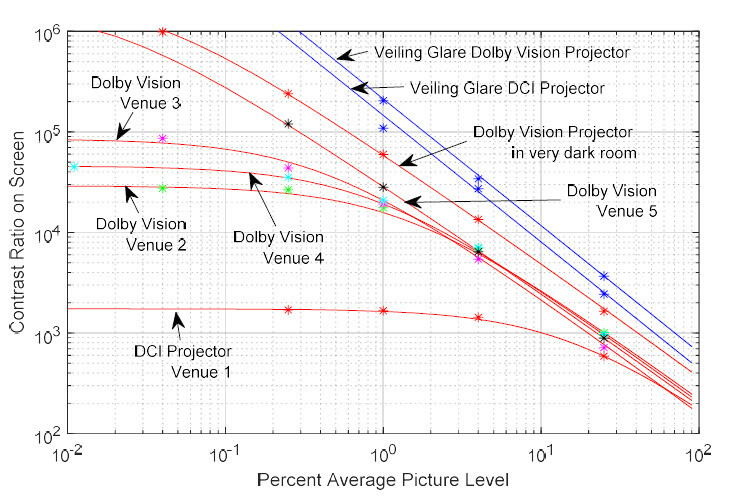 They also saw some variation in Dolby Cinema theater performance which they attributed to dirty optics and port glass. NHK described a new portable 8K camera for broadcast production. It is a single sensor design with a Bayer RGGB color filer pattern that can capture at 60 fps. But they said there is a 120 fps mode that captures using interlaced fields. A companion camera control unit is needed to de-Bayer the signal to produce an RGB signal. NHK did not say if they also de-interlace the signal, but is broadcast really ready to consider a de-Bayered image and interlaced formats? There were also some good papers on color science that I won’t try to summarize here. These are all very important because we don’t have a good color appearance model for HDR, and a model is needed for calculation of color volume and color accuracy. A color appearance model should adjust measured data to correlate with the way the eye perceives colors. This is based upon the ambient light in the room, the spectral composition and location of this light and the adaption state of your eyes. Many models have been developed for SDR displays and printed materials, but current research is focused on developing new model for the HDR range and viewing environments. Gary Demos gave a paper and followed up with small group demonstrations at the house of Joe Kane. He has been developing an update to the ACES 1.0 color management system that was implemented before HDR displays came around. He proposed a different method for color and tone mapping that he hopes is a candidate for ACES 2.0. His demos showed color patterns and images where ACES 1.0 has problems and clips colors in HDR content. His approach does a much better job. On the exhibitor floor, there were three 2000 cd/m² grading monitors (previously seen at IBC) TV Logic and Flanders Scientific use a 31” Panasonic 4K panel and backlight unit that features 2040 LEDs that are all presumably addressable. Brightness ranges from 0.002 to 2000 cd/m² (even with a full white screen). There is 100% coverage of the DCI-P3 color gamut as well. TV Logic is selling theirs now for $43K and Flanders Scientific says it will be Q1’18 before they ship with a price still to be determined. Canon has its own design of a 2000 cd/m², 4K 30” monitor that can also support this luminance with a full white screen. Canon does not provide many spec details but says the color primaries are close to 2020, so easily covers 100% of P3. This is available to order for $50K. Is Improved Scaling the Key to the 8K Content Void?